Send your graduation greetings to your friends through this card. 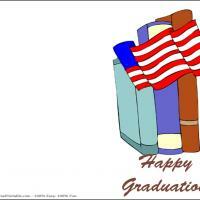 These printable Graduation cards feature a candid American flag over three text books. A simple message of a Happy Graduation Day will delight any graduate. Just print these free printable cards and fold in half. There is room inside to add a personal message expressing your pride and encouragement for the future. Send this to any American friend or relative.